This is an interesting article about the island of Samos, where the luxury resort Halcyon Hills is being built, by Dave Seminara. “The name Samos means “high” in the ancient Ionian dialect of Greek, and historians assume the island was thus named after its mountainous interior. By mid-summer, the island’s terrain is mostly brown, but in early June, it was still delightfully green and punctuated with wild flowers and aromatic pine trees. As we drove west on a dizzying, but scenic, road from Pythagorion towards Kambos, the base we chose in the southwest, we passed a slew of stands selling honey, one of Samos’s best exports. I didn’t indulge at first, but after seeing so many of the places, my curiosity got the best of me and I spent the remainder of my week drizzling honey on anything that moved. Near our base in Kambos, a pleasant enough one horse town that serves as a convenient base for exploring the beautiful west end of the island, we fell in love with a psili ammos beach. I say “a” rather than “the” because psili ammos means “fine sand” in Greek and you find lots of beaches with this name all over the Greek isles, including two on Samos. Both are great, but the Psili Ammos beach just outside Kambos may be the best beach for kids I’ve ever experienced. It’s a lovely beach with unbelievably shallow water, so even my 2- and 4-year-olds could comfortably wade very far out from the shore. From Kambos, take a drive out to Kalithea and Drakei to see one of Europe’s last great, undeveloped coasts, filled with stunning cliff top panoramas of the blue Aegean and the surrounding islands. Around every curve, you’ll want to pull over and get our your camera. Western Samos has the feel of a wild, virgin paradise. There are no tacky souvenir shops or much of anything, save the odd taverna here and there but the natural beauty is astounding. Just as interesting as the coastal drives are excursions into the mountainous interior. 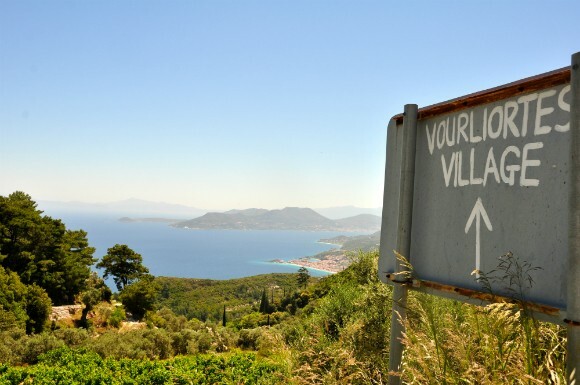 We drove up to the enchanting mountain villages of Vourliotes and Manolates for stunning views and a taste of village life and stumbled across a group of drunken seniors celebrating a religious festival on a Monday morning. You could easily idle away a week on a beach in Samos but the most rewarding part of my ten days on this addictive island were hikes I made up to Panagia Markini, a 13th Century cave church near Kallithea, and the 10th Century Evangelistria convent, near Kambos. Both are fairly strenuous but the views are astounding and the icons behind the curtain in the cave church are haunting and beautiful. If you look at a map of Samos, you’ll see little black dots with crosses, signifying churches and monasteries that were built all over the interior of the island, many of them in hard to find locations to ward off invaders. Working monasteries like Panagia Vrontiani and Megali Panagia have beautiful frescoes and are well worth a visit. Samos also boasts good, sweet wine that can be bought straight off the back of a small vintners pickup truck for a song. I feasted on grilled souvlaki, calamari, octopus and other treats, always for about 7-9€, and I never had a bad meal. We experienced remarkable hospitality wherever we went and even our buggy car owner turned out to be a gem. We disliked the small rooms in her hotel but rather than pout or blame us, she helped us find a more suitable place to stay. Our car rental experience seemed to sum up the island’s laid-back charm. We picked up our car in Pythagorion, in the island’s southeast, but later on decided that we wanted to drop it off in Karlovasi, where our ferry was to leave up in the island’s northwest. A branch of National car rental, which also offered by far the lowest rate for an automatic transmission car at 30€ per day, told us not to worry about making the 1.5-hour drive back to Pythagorion to return the car, even though they have no location near Karlovasi. “Just leave it at the ferry, and put the keys under the mat, we’ll go get it,” said Alex, the young man we dealt with who told us there was no extra charge to leave the car anywhere on the island. The island that houses Halcyon Hills features in the latest Europealacarte blog, of what to do in Greece, excluding Athens. At no. 5 in the list is to visit Vathi on Samos. Vath is the island’s main tow, and offers many activities to visitors. This blog also highlights the islands proximity to Turkey.